As we did last month and as we intend to do every month, we’re very pleased to share some of the information posted during the month by our friends at Sonic Cathedral, the website that specialises in reviews of albums by female-fronted bands. Sonic Cathedral covers a wide range of female-fronted metal and rock. Once again we’re presenting the album details, an intro from SC, and a link to the full review on SC’s website. Sonic Cathedral has a web magazine and music store and a Facebook page. We highly recommend both of those places to female-fronted bands, labels and fans. 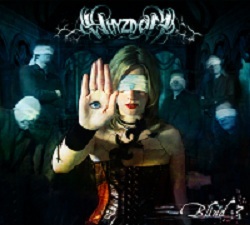 Album Review: Whyzdom – Blind? Just when you think the Dutch have mastered Symphonic metal, the French band Whyzdom is crashing on the scene with their orchestral arrangements and heavy melodies. After having gone through temporary vocalists to fill a void, they finally secured the services of Elvyne Lorient for full-time duty. Her soothing and enchanting vocal style softens the crushing riffs and provides an equal balance between the heavy and the not-so-heavy melodies. The new album Blind? has 11 songs and packs over an hour of Symphonic metal that should appeal greatly to fans of the metal subgenre.